Germany may not have looked like world champions in Saturday’s Euro 2016 quarter-final against Italy, but in the end they triumphed thanks to a part of the game in which they are the undisputed world title holders – the penalty shoot out. Neither side truly deserved to win what was a disappointing game which ended 1-1 after extra-time and both did horrendously in the shoot out, which stood at just 2-2 after the five attempts each. But in the end, on the 9th penalty, Germany 's keeper Manuel Neuer dived to his left to save Matteo Darmian’s kick after defender Jonas Hector’s shot had squeezed under Italian keeper Gianluigi Buffon to set off the celebrations. It is so long since Germany have lost in a World Cup or Euros shoot-out that neither of the countries which took part when they last did, 40 years ago, exist anymore – the loss for West Germany came against Czechoslovakia in the final of the 1976 European Championship. Indeed, until Saturday Germany had not even missed a single shoot-out attempt. The last German player to miss was in 1982. That record ended when Thomas Mueller’s softly hit shot at perfect catching height was saved by Buffon to start a series of failed attempts in what was a poor shoot out. Germany though it will be who go through to Thursday’s semi-final in Marseille where they will meet either France or Iceland who will finish off the quarter-finals on Sunday. The other semi-final will feature Wales against Portugal in Lyon on Wednesday. There is no doubt that Joachim Loew’s team has an abundance of quality players, a strong group ethic and great mental strength but the flowing passing and movement they showed in Brazil two years ago has rarely been evident in this tournament. Germany’s moves were more labored, less precise and lacking zest for much of the game while Italy, who had sparkled against Spain in the previous round, were unable to rediscover their rhythm. Loew’s tactical gameplan lasted just 16 minutes when midfielder Sami Khedira was forced off with a groin injury and Bastian Schweinsteiger took his place on the right of midifeld. Although Germany adjusted well they created little, though there was more urgency after the break. The three-times European champions took the lead in the 65th minute when Mario Gomez fed Hector down the left and his low cross flew off Leonardo Bonucci and Mesut Ozil pounced to drive past Buffon from close range. It could easily have been 2-0 moments later when Ozil chipped the ball into the box towards Gomez whose audacious flick was brilliantly saved by Buffon and his still quick reflexes. But Italy, as they so often do, dug their way back into the game and they got back on level terms 12 minutes before the end of regulation time when Jerome Boateng handled the ball while leaping for a header with Giorgio Chiellini. Boateng raised his his hands high as he rose, perhaps to indicate he was not fouling the Italian, but in doing so he gave the Hungarian referee Viktor Kassai little choice. Bonucci kept his cool and fired home the spot-kick — the first goal Neuer had conceded at the tournament after four successive clean sheets. Matteo Di Sciglio went closest for Italy in extra-time, cutting in from the left and unleashing a dangerous drive which flew into the side netting while Ozil had a late chance but shot straight at Buffon. It left nothing but penalties and the almost inevitable outcome – albeit without the customary clinical approach from Germany. Italy will head home with the feeling that they had failed to make the most of catching Germany on a night when they looked below the best. 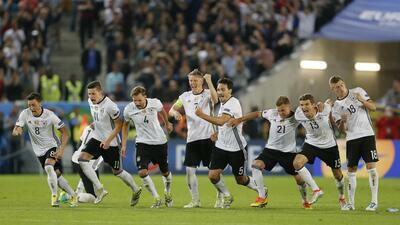 For Loew’s team the chance of becoming reigning world and European champions remains alive.